The Berlin Wall was a wall separating the Eastern side of Berlin from the Western side. It was a symbol of The Cold War until it fell in 1989. Here are ten facts about the Berlin Wall. Construction of the Berlin Wall began on August 13 1961 as a way of separating the three zones controlled by France, Britain and America from the zone controlled by the Soviet Union. After World War Two, Germany was split into four zones, each occupied by one of the four Allied powers that defeated the Nazis. The zones controlled by France, Great Britain and America became West Germany, or Bundesrepublik Deutschland (Federal Republic of Germany). The Soviet-controlled zone became East Germany, or Deutsche Demokratische Republik (Germany Democratic Republic). Germany's capital, Berlin, was situated in Soviet-controlled East Germany , but as this city was the administrative area for the Allied forces, it too was split into four. This meant that France, Great Britain and America controlled West Berlin, whereas the Soviet Union controlled the East. Relations between America and the Soviet Union soured considerably during much of the second half of the Twentieth Century. The Berlin Wall was a symbol of this hostility, a physical representation of what was called the Iron Curtain. The Berlin Wall was constructed as a way of preventing East Germans from entering West Germany. It was not so much a boundary for West Germans wanting to enter the East, who were able to do so by obtaining a permit several weeks in advance. It didn't face much opposition by the western powers as its construction confirmed that the Soviet Union were not planning to take over West Berlin. Official figures show that at least 136 people died trying to cross the border. People attempting to get from East to West were regarded as traitors and guards were instructed to shoot at them if they attempted to cross, although not to kill them. The west side of the Berlin wall was covered in graffiti. The East side was not. The Berlin Wall was something of a propaganda disaster for the Soviet Union and East Germany. It showed the communists to be tyrannical in the way they controlled the movement of their people and their willingness to shoot at people they considered to be traitors. 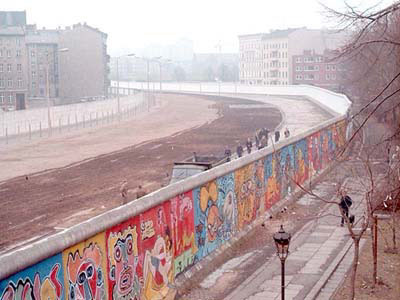 West Berliners used the Berlin Wall as an ideal way of getting rid of rubbish. If they had anything that needed throwing away, they threw it over the wall. After all, it wasn't as if they would be made to go over it to fetch it back. Michael Knight himself, David Hassellhoff, is huge in Germany. The Hoff performed his hit "Looking For Freedom" while standing on the Berlin Wall in 1989. Despite there being a wall separating East from West, there were a number of checkpoints that allowed passage to and from the two sides. The most famous of these was Checkpoint Charlie, a checkpoint separating the American-controlled zone of West Berlin from the Soviet-controlled East Berlin. The guard house for Checkpoint Charlie was removed in October 1990 and is now situated in the Allied Museum in Berlin-Zehlendorf. The last remnant of Checkpoint Charlie, an East German watchtower, was demolished in 2000. 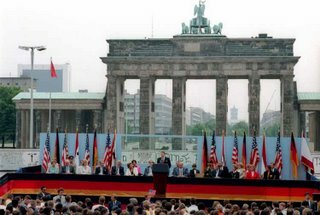 Although November 9th 1989 is recognised as the date of the fall of the Berlin Wall, official demolition of it didn't start until June 13th 1990. Between November 9th and June 13th, border controls still existed, although were less strict that previously. Parts of the wall was chipped away by Germans to keep as souvenirs/sell on eBay. People who did this were known as "wall woodpeckers" (Mauerspechte) Some parts of the wall had been taken down but only to make way for more crossing points. All border controls ended on July 1st 1990 and Germany was recognised as one country again from October 3rd 1990. The Berlin Wall was a physical barrier above the ground, but what about under the ground? Berlin, like many major cities, has an underground or subway system. After construction of the Berlin Wall, trains could only operate on the side in which they were based. Some trains either ran purely on the west side or the east side. Trains which previously crossed the border would now go no further than its respective border and then turn back. This was apart from three lines that were used by West Berliners but which went through East Berlin for a small part of their journeys. They travelled through several stations which became known as Ghost Stations (Geisterbahnhöfe), dimly lit and heavily-guarded stations that the trains were unable to stop at. This was apart from certain exceptions: Friedrichstasse Station was situated in East Berlin, but was used a transfer station for passengers to get onto other trains travelling to locations in West Berlin. Passengers could also enter East Berlin at this station if they had the relevant permits (also needed for crossing the Berlin Wall). Bornholmer Strasse Station was a station that both West and East Berlin trains passed through, but not on the same lines. Neither side's trains stopped at the station, and the two lines through it were separated by a tall fence. Finally, Wallankstrasse Station was another station situated right on the border. There were exits in the station, some leading the West Berlin, some leading to East Berlin. The exits to West Berlin were open and allowed people to pass through it freely. The exits to streets in East Berlin were locked. When the Ghost Stations were reopened after the fall of the Berlin Wall, the first people using them found them preserved as they were when they closed in 1961 with the same signage and advertisements on the walls.